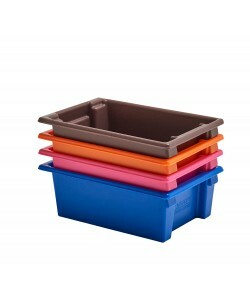 Fletcher European Containers are manufacturers of a range of hygienic plastic food stacking containers and ingredient storage trays with incredible hygienic attributes. We understand that having the best hygiene equipment in place is of utmost importance for many industries including food manufacturing and food processing, pharmaceuticals and healthcare, catering and hospitality; and the bakery industry. 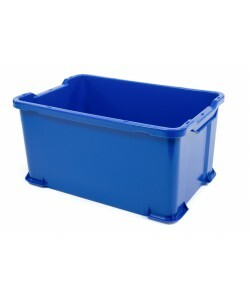 Exhibiting a number of plastic containers and plastic boxes that are easy to clean, durable, long lasting and hygienic, you are certain to find a hygienic storage container to suit your needs. Perfect for high care environments such as food factories, laboratories, clean rooms, commercial kitchens, bakeries and food preparation areas, our range of food grade containers are designed for use within hygiene sensitive applications such as food storage and food handling for example. Each of the plastic containers incorporates a hygienic design that allows them to be easily cleaned as well as stack on top of one another. 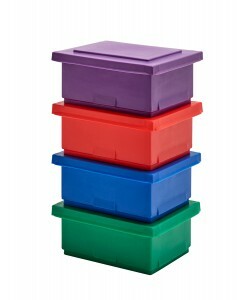 These plastic stacking boxes are all manufactured from food grade plastic materials and can all be supplied with plastic drop-on lids. 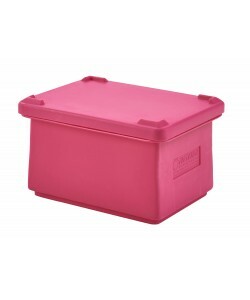 Many of these ingredient storage containers are classed as Euro containers due to their European standard sizes and are compatible with a number of our Euro pallets and plastic dollies. Ideal for use as food storage containers and food handling the rotationally moulded HYGIBOX range of hygienic storage containers are perfect for the food manufacturing and food processing industries. 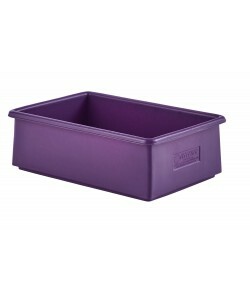 An exclusive product range to Fletcher European Containers and trademarked, the HYGIBOX has been designed and developed by ourselves to provide the ultimate colour coded plastic container that offers a level of hygiene like no other. Manufactured from food grade polyethylene these plastic stacking containers are produced via a rotational moulding process. This stress-free manufacturing process ensures a plastic box that is incredibly durable and resistant to cracking and breaking. 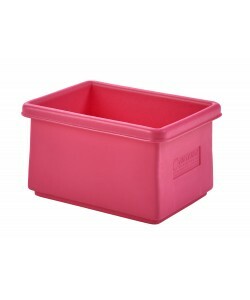 The HYGIBOX range of Euro stacking containers includes the HYGIBOX which are 600x400 plastic containers with a height of 245mm, the Hygibox40 Euro containers sized 400x300 with a height of 235mm, Hygibox155 600x400 plastic boxes with a height of 155mm and the Hygibox200 which is also a 600x400 European stacking container with a height of 200mm. 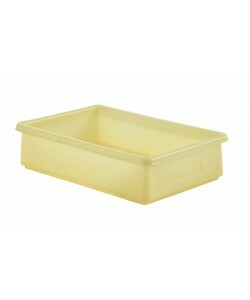 Separating these hygienic plastic containers from others is their adaptability and durability. Perfect for storage of food ingredients and for handling food produce unlike injection moulded plastic trays the HYGIBOX is resistant to cracking, splitting or flaking. As standard plastic crates age they tend to degrade. This degradation then causes the plastic containers to produce swarf or plastic flakes which can lead to contamination of foods and food ingredients which ultimately leads to product recalls. 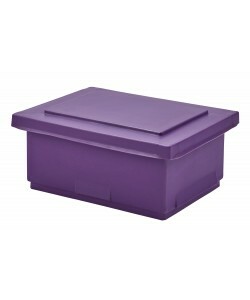 The HYGIBOX eliminates this risk as the incredibly durable plastic storage containers do not degrade like standard plastic boxes and they do not produce swarf. Available in a huge range of over 12 food approved colours the HYGIBOX is perfect for colour coding applications and are commonly used as ingredient storage containers. 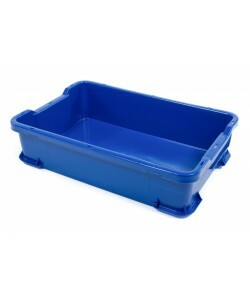 Due to the Euro sized footprint of the HYGIBOX range of plastic stackable boxes each of the different sized plastic container is compatible with our plastic Euro dolly, the rotoXD91. These 600x400 plastic dollies are perfectly designed for handling Euro containers and plastic stacking containers safely and securely and are incredibly hygienically designed themselves. 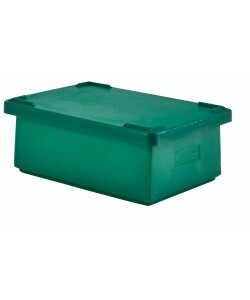 Plastic boxes with rounded interior edges designed to minimize the number of possible dirt traps and crevices. Popular products within the meat processing industry as well as food manufacturing the UB903, UB904, UB905 and UB906 are all plastic stacking trays often referred to as meat crates. 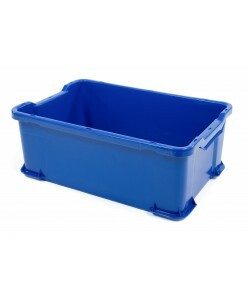 Commonly used within the meat processing and fish processing industries as plastic meat crates, storing meats such as pork, beef and poultry these plastic stacking containers can all work together as they share an identical 600x400mm footprint. 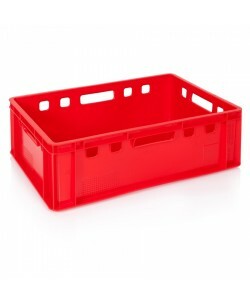 Available in a variety of food approved colours these plastic meat crates are used for handling meats and fish as well as food ingredients and food produce. Perfect for food handling the plastic crates can be easily cleaned and reused time and time again. 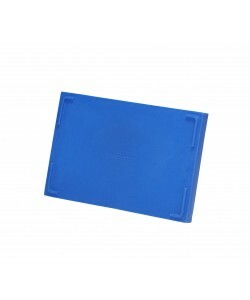 With 4 different sizes to choose from and optional drop-on plastic lids available these meat trays and fish crates can be supplied in blue, red or white and can also be fitted with tag slots for product identification. The Euro-sized footprint of these 600x400 plastic trays allows them to be easily handled on a variety of plastic dollies as well as Euro plastic pallets. Utilising all of the available space on a Euro pallet, these meat trays prove to be easily handled, stored and transported. Compatible with the rotoXD91 and rotoXD92 which are both 600x400 Euro dollies, you can safely and securely handle stacks of plastic meat crates around a busy environment such as a food factory. 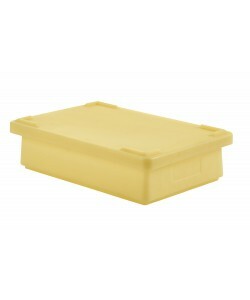 Complementing our range of hygienic storage containers are a variety of specially designed plastic boxes and plastic containers perfect for food handling and ingredient storage applications. One of these ingredient storage containers is the rotoXFB which was originally designed for the bakery industry to be used as a fat box. Designed to store blocks of fat or lard these food grade tubs are now widely used throughout the food industry for ingredient storage. 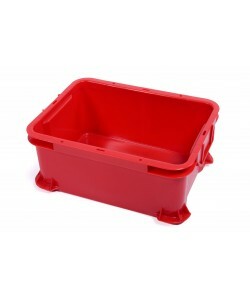 The rotoXFB is available in a wide range of over 12 food approved colours to assist with colour coding and these plastic ingredient containers are also compatible with our plastic dollies and bakery trolleys. The rotoXD38 is a plastic dolly designed to suit confectionery trays but it can also be used to handle two stacks of these food ingredient containers side by side. Perfect for the bakery industry and food preparation areas the rotoXFMR is a stainless steel mobile frame often called an ingredient storage rack and is designed to handle 3 of the ingredient storage containers. Another of our ingredient storage racks, the rotoXFBR is designed to handle up to 6 of these plastic stacking boxes safely and securely. 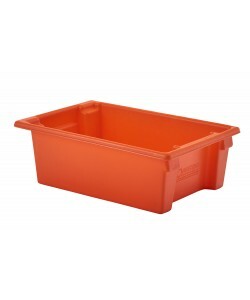 Completing the range of hygienic storage containers are a number of different sized plastic stacking trays designed to be used for many food handling and food storage applications. Fletcher European Containers manufactures many plastic dollies to suit these ingredient storage containers, for example the rotoXB1915 is a plastic stacking container supplied complete with drop-on lid and is compatible with the 600x400 plastic dolly, the rotoXD92. Think hygiene, think HYGIBOX. Think rotoX.